At the age of 24 I decided to start my own tailoring business. I took a sitting within James and James, 11 Old Burlington Street. I spent 4 years in these fabulous old premises, after making bespoke suits and a topcoat for H.R.H. 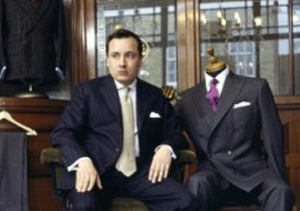 The Prince of Wales and appearing in the Financial Times and the Independent newspapers with glowing reviews, which firmly establish my bespoke tailoring business. I also started my business trips to New York and I still have many of my clients from those first trips, whom I now count as friends.